A career game from sophomore Lonnie Grayson guided the Army West Point men’s basketball team to its fourth-straight win as the Black Knights claimed a 69-63 road victory over Lafayette. 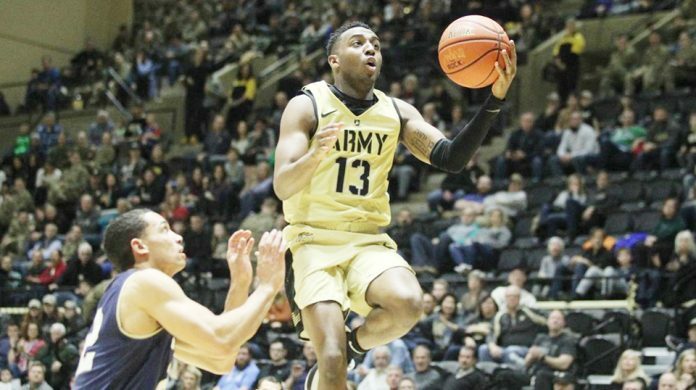 EASTON, PA. – A career game from sophomore Lonnie Grayson guided the Army West Point men’s basketball team to its fourth-straight win as the Black Knights claimed a 69-63 road victory over Lafayette on Saturday afternoon at the Kirby Sports Center. Grayson provided a much-needed spark off the bench for the Black Knights (11-10, 6-2 Patriot League) against Lafayette (5-14, 2-6 Patriot League). The second-year guard dropped a career-best 19 points to go with a career-high six rebounds and three steals. Army got another efficient scoring outing from Matt Wilson after the center put up 13 points on 6-of-7 shooting to pair with eight boards. John Emezie was electric off the bench and came up huge in the second half for the Cadets, scoring all 11 of his points in the final frame. Army got off to a slow start offensively and was unable to find the bottom of the basket. On the other end, the Leopards began to heat up from downtown. After missing their first three attempts from long range, the Leopards buried each of their next five 3-pointers to go ahead 21-12 with 11:58 left in the opening half. The Black Knights’ defense began to clamp down and held Lafayette scoreless for a seven-minute stretch. During that time, the Cadets evened the score up at 21-21 with a 9-0 run. Grayson and Wilson carried the scoring load in the first half, combining for 20 points. The duo combined to make nine shots while accumulating just one miss as the Black Knights went into the half trailing, 33-29. Lafayette came out for the second half and continued to drain shots from long range. However, the Black Knights hung in there and battled back with an 11-2 run to pull within three, 50-47, with 11:18 on the clock. The trio of Grayson, Emezie and Josh Caldwell provided a lift off the bench and it was not much longer until the Cadets erased a 12-point second-half deficit to take a 54-52 lead. Army built its lead as large as eight after six unanswered points and hung on the rest of the way to secure the 69-63 road win.